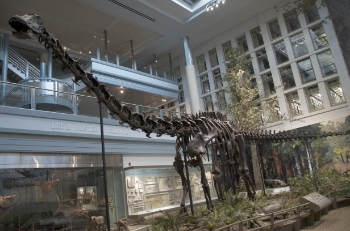 The giant skeleton of a Diplodocus longus is to be auctioned off next month and could go for as much as $1million. Dinosaur fossils are usually very difficult to obtain. The amount of specialist equipment required to excavate them from the ground, along with the time required to delicately clean and restore them means that researchers are usually the only people who go through the painstaking process. Luckily for the general public, many of these specimens get donated to museums for all to see. But now, a rare dinosaur skeleton is to be put up for auction, presenting a unique opportunity for you to buy your own dinosaur. The 55ft-long specimen of the long-necked Diplodocus longus is being sold at Summers Place Auctions in Billingshurst, West Sussex, on November 27th. It is believed to be the first sale at a UK auction of a large dinosaur skeleton, according to experts. The 19ft-tall female skeleton, nicknamed "Misty", was found back in 2009 almost completely intact by the sons of paleontologist Raimund Albersdoerfer near a quarry in Wyoming in the United States. Albersdoerfer had been taking part in an excavation when he sent his sons away to dig in an area nearby "to get them off his back." To the surprise of their father, Benjamin and Jacob returned at the end of the day and revealed they had found a large bone. Nine weeks later, the entire dig team had uncovered "Misty" and sent her off to be painstakingly prepared at a leading fossil laboratory in Holland before being assembled in the UK. The skeleton will now be sold, with estimates ranging from $650,000 to $1million. It is part of Summer Place's Evolution Sale, which is being curated by natural history expert and author, Errol Fuller. He has written a series of books on extinct creatures and said on the subject of the Diplodocus longus: "There are probably about six of these in the great museums of the world, including in Pittsburgh and Washington. You are talking about a very rare item indeed. Even if you were lucky enough to find one in the first place, the digging out and the preparation then involved is an enormous undertaking." Mr Fuller goes on to say that the skeleton could appeal to one of the emerging museums in the Far East or Middle East, or as an addition to a private collection of someone with great wealth. Although a mere few might be able to participate in the later stages of this auction, it is still amazing to have the opportunity to own a pre-historic giant that roamed the planet 150 million years ago. We know what you're thinking - it would look great in the living room!